This year marks the centenary of James Connolly coming back to Ireland from the US, the start of six hectic years of activity ended only by the firing squad. But Connolly is returning again in our own day. The public have voted him one of ‘Ireland’s Greatest’ and new documentaries have told the fascinating story of his life, introducing him to a new generation and reawakening the interest of others. Connolly was forced to struggle against poverty from day one. Even the fact of his birth in Scotland was due to the desperation that forced his parents to emigrate. His father carted dung from the streets of Edinburgh when he was lucky, and James was forced to work in deadend jobs from around the age of ten, eventually having to join the British Army for a living. So Connolly didn’t need books to tell him that the world was divided into opposing classes. Poverty for him was never a sociological concept, but a harsh reality. His lack of formal schooling actually spurred him on to learn things for himself, and the writings of this self-taught socialist can still put many an academic historian and professional journalist to shame today. Back in Edinburgh after deserting the army, Connolly threw himself into the socialist movement. This apprenticeship in speaking, writing and agitating laid down a solid foundation for a lifetime of activism. 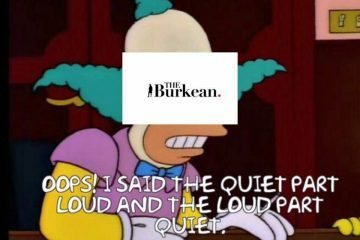 He won a decent enough vote as a local election candidate, but was clear on the limits of electoral politics: “The election of a socialist to any public body at present is only valuable insofar as it is the return of a disturber of the political peace.” But it was in Dublin that Connolly came into his own. As organiser for a small socialist party, he was central in revolutionary socialism putting down real roots in Ireland for the first time. Despite its small numbers, the party organised impressive protests against war and British royalty, and its paper The Workers’ Republic presented an unashamedly socialist take on the events of the day. 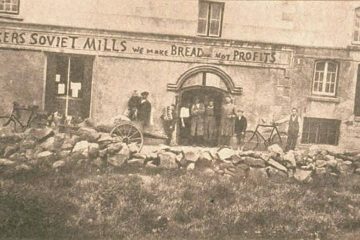 The founding of the Industrial Workers of the World in 1905 showed a new way for the movement and for Connolly himself. The IWW openly proclaimed that the bosses were not their partners but their sworn enemies, and organised a series of bitter struggles to win better conditions for workers. Connolly became an organiser for the movement and one of America’s best-known propagandists for industrial unionism — the idea that workers should organise in one big union to take control of industry from the capitalists. Unlike the old conservative unions, the IWW reached out to organise immigrant workers. Connolly was to the fore in facing the reality of a multi-ethnic working class of diverse origins. He was active in bringing Italian workers into the movement, even learning a little of the language himself. The Irish Socialist Federation drew on Ireland’s radical traditions to spread leftwing ideas in the Irish-American community. This was helped by a revival of socialist politics back in Ireland, and — although Connolly was beginning to make a name for himself on the American left — he was itching to get back home. A small but effective group of socialists in Ireland were successfully pushing their ideas in a workers’ movement energised by union leader Jim Larkin. The cultural revival provided another audience for socialist politics, and the rise of the women’s movement contributed to a mood of rebellion against the status quo. Connolly participated heart and soul in this ferment, not least with his pen. A frontal attack by a Catholic priest aimed to take the wind out of Irish socialism’s sails, but Connolly answered it powerfully in his pamphlet Labour Nationality and Religion. Twelve years of research came together with the publication of Labour in Irish History, a book that rescued the forgotten stories of working people and their resistance, and argued that this same resistance was the key to liberation: “only the Irish working class remain as the incorruptible inheritors of the fight for freedom in Ireland”. His work as a union organiser in Belfast gave him an opportunity to put his brand of fighting trade unionism into effect again. Workers who were brutally exploited won increases in their wages, their leisure, and especially their dignity. Workers who had been ignored by mainstream trade unionism because they were unskilled or women or Catholics were organised to stand up effectively for their rights. But, as Connolly recognised, “Our fight is a fight not only against the bosses, but against the political and religious bigotry”. came down to take the lead while Jim Larkin was imprisoned, and spent a week in prison himself until winning his release by a hunger strike. He always looked to the fighting spirit of rank-and-file workers to win the strike, and appealed for solidarity from the British trade union movement. When its leaders refused to turn sympathy into sympathetic action, the Dublin workers were left high and dry — a serious setback to Connolly’s hopes. Worse came in August 1914 with the outbreak of world war. The tragedy of workers marching to mass slaughter to decide which empires would rob the world was made far worse by the collapse of the socialist movement internationally, its anti-war resolutions forgotten as they rushed to support their governments’ war effort. 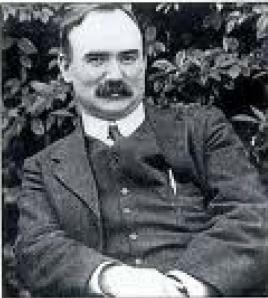 Connolly opposed the war with every fibre in his being, hoping to see strikes and rebellions break out against it: “a great Continental uprising of the working class would stop the war”. When this didn’t happen, he was more isolated than ever. With few forces to hand, Connolly concluded that an insurrection against British rule was probably the most that could be achieved for the time being. Far from abandoning the interests of the working class, he continued to lead strikes and welcomed every sign of workers’ resistance anywhere, and believed that a blow struck for independence would leave Irish workers in a better position to fight on. He played a leading part in the Easter Rising and was badly wounded. The British government didn’t let that stop them from making sure that Connolly couldn’t live to fight them another day. Throughout his life Connolly drew on the work and example of thinkers and fighters who had come before him, from Karl Marx to Wolfe Tone. But he was neither a hero worshipper nor an academic nitpicker. He refused to take any word of his predecessors as gospel that could be applied unchanged in his own day. But whatever criticisms he had were not a case of being smarter than them, but of asking how far their ideas could be of use in the struggles ahead. We need a similar approach to Connolly himself. A century of experience has shed more light on some of the problems he faced, and thrown up problems he never had to deal with. Any honest look at Connolly will inevitably show things he got wrong or left undone. But it will also show a powerful thinker whose work is still full of lessons and insights to help us in our own battles, still the towering figure of Irish socialism. It should really come as no surprise that Connolly is once again coming home. A world in chronic crisis demands revolutionary change, and that can only bring the politics of James Connolly to life again in the attempt to finish what he started, to build a socialist Ireland in place of the mess created by those who have occasionally claimed to be acting in his name. Aindrias Ó Cathasaigh’s books include ‘James Connolly: The Lost Writings’ He is also editor of the socialist journal Red Banner and scriptwriter of the recent highly acclaimed TG4 series ‘1916 Seachtar na Cásca’ which told the story of each of the seven signatories of the 1916 Easter Proclamation.